Amsterdam Fishery Exhibition - The Variety of Exhibits at a Fishery Exhibition - The Dutch Cure - Exhibition at Arcachon - The higher aspects of a Fishery Exhibition - Questions for Solution - The great question, How to Capture! - Mr. Buckland's Museum of Economic Fish Culture - The Brighton and Crystal Palace Aquaria and the Lessons which may be derived from them. I HAVE attended no fewer than five general "Fishery Expositions." Only one of these, however—"an exhibition of salmon ladders, coupled with an inquiry into the present state of the salmon rivers of Great Britain "—has been held in this country. The others were held abroad. The first exhibition of the kind, and the one which is thought to have been the best, was held at Amsterdam. It was, as far as it went, a thoroughly practical exposition of the arts of fishing. One thing it effectually did: it brought the food-fisheries of Holland (all the continental fishes, even the most insignificant and repulsive, are used as food) into a focus, and allowed people to see what progress was being made in the arts of fishing, and what position Holland occupies as a fishing nation compared with France or Britain. A fishery exhibition, or "exposition," as it is called, is interesting even to the uninitiated. Much taste is often displayed in showing the various nets; and there are always many curiosities in the shape of fish-traps, such as the quaint-looking cylinders used for the taking of eels, and the curious cages employed in the capture of crustaceans, not to speak of some of the unique self-acting fish-catchers which the French have invented. The little instrument that gives its death-blow to the monarch of the sea may be examined, as may the tiny hook that takes the trout a prisoner. The fishes themselves, either alive or dead, can be seen in most fishery exhibitions; and, while the epicure may eye the tid-bits, the economic housewife is taught that all parts of a fish may be made useful. At the Hague Fishery Exposition large jars were exhibited filled with choice morsels from parts of the cod that have hitherto been thrown away as inedible. The lips, the cheeks, and the jelly from the head of that fish, afford choice eating. The merits of Dutch cured herring, i.e. fish pickled with a portion of the intestines left in them, were at the Hague contrasted with the British mode of curing, and the Dutch way was found in many respects the best. The fish-curers always send a good stock of preserved fish to fishery exhibitions: sardines from Concarneau, matie herrings from Vlaardingen, anchovies from Genoa, pickled mackerel, preserved oysters, fish-flour, etc. etc., are plentifully shown. The "exhibits" the way of prepared fish-food were very heterogeneous at all the exhibitions—each curer, of course, showing on his own behalf. The collection of food-fishes in these shows was nothing like so perfect as that in the Industrial Museum of Edinburgh; where most of the food-fishes—ranging in variety of size and shape from whitebait to sturgeon—may be seen in a finely preserved state. access to the sea, were displayed at Arcachon, either by pictures or models. Pearl-fishing, coral-diving, seal-slaughtering, turtlehunting, and the sponge harvest, can all be well represented at a fishery exhibition. After the eye had been gratified with numerous out-of-the-way wonders, there are left for the fishery economist certain higher aspects of the show. All that could be seen, whether of products or apparatus, supplied texts on which to hang lay sermons about fish, and the best mode of making them useful to mankind ; about fisheries, as an outlet for capital, as a medium for the employment of labour ; not to speak of the important question-important at least to great maritime nations like England and France-how far the fisheries may be made to serve as a training school for either the imperial or the mercantile navy. Nor was the force of any of the expositions expended even so. It was attempted to illustrate the technology of fisheries, as in the arts of boat-building, rigging, sail-making, anchor-forging, and net-weaving. Attempts were likewise made to estimate and compare the productive powers of salt and fresh water, and to measure the additional ascendency which man might obtain over the ocean if he were thoroughly to cultivate it. None of the exhibitions have yet taught us what we most want to know as regards the food-fishes of the sea. At what age (the reader must excuse this iteration) do these animals become reproductive, and how long is it ere their eggs come to life ? Many questions bearing on the natural history of fish in general, and on the food-fishes in particular, were propounded at Arcachon ; but have they yet been answered ? Of oysters it was asked-At what age do they reproduce 7 what is the average number produced by individuals at a time? what causes may annually influence their fecundity? what is their food! what substances do they attach themselves to 7 and how long do they live? As to fish in general, the following questions were put :What, in all probability, becomes of fish, both migratory and other, when they cease to show themselves on our coasts ? on what kind of bottom does each species prefer to deposit its ova ? is it possible to determine the spawning time of most useful species? and is it possible to cause natural and artificial spawning? None of these questions were answered at Arcachon, nor yet at the Hague. Nor have our British naturalists ventured to grapple with them, except in a very superficial way. There was hung up in the fishery exposition at Boulogne a chart exhibiting " the grand tour" of the herring, and it was astonishing to note that many of the visitors were impressed with the belief that this grand tour was real, and was still going on year after year ! There are naturalists who think the mackerel to be also a fish of passage, making long voyages from north to south, and vice versa. The turbot, too, has been described as a migratory fish, and it has been often asserted that salmon make an annual visit to the North Pole ! Then as to the spawning of fishes the most absurd ideas used to prevail. All kinds of outre sea substances were set down as fish-spawn; and as to the modus operandi of spawning, the queerest fancies were indulged in even by persons who ought to have known better. How best to secure the fishes of the sea is still an unsolved problem. The French have invented various self-acting machines for their fisheries. One of these, a model of which was shown at Arcachon, is so contrived that, the moment a large fish is caught, it gives the signal of its capture by causing a bell to ring ! An ingenious "salmon-catcher," which is used on some of the French rivers, excited the attention of the visitors to Arcachon. It is formed of three large fanners or dippers of strong network, which revolve on an axis and are driven by the water of the stream on which they are placed, and in the inner end of each of the fanners there is a funnel, through which the fishes find their way into a large reservoir, where they can be detained, in water of course, till wanted for the table. Throughout France there are numerous contrivances by which fish capture themselves. Indeed, at the productive viviers of Monsieur Boisere, situated at the west end of the basin of Arcachon, the working of the fishery is so planned that the lagoons form a large reservoir from which the fish can be easily ladled out as they are wanted for the market. In the construction of his viviers, the proprietor has so studied the economy of labour that his staff of workers consists of only half a dozen persons-a very moderate number when there are three hundred acres of water, with a great variety of gates and canals, to be looked after. In Holland there are no viviers; and although the numerous canals would give abundant opportunity for fish-breeding, I could not ascertain that the Dutch people carried on any system of fish-culture beyond making every canal, big or little, a reservoir for eels, of which immense quantities are captured for the Paris, Brussels, and London markets. It may be said of all these foreign fishery exhibitions that they were not what is wanted : they were mere temporary displays, forgotten a day after they were closed ; but what is wanted is a permanent fishery " exposition," where the science of the sea can be always on exhibition, and where those who do not have business on the great waters may see what men have to encounter who have. In Mr. Buckland's "Museum of Economic Fish-culture" at Kensington, the public will find an admirable nucleus of the kind of permanent exhibition of fishery products and apparatus which we should like to see established in all countries. There are several novelties in Mr. Buckland's collection well worth seeing. The casts of large salmon and fine trout so beautifully coloured by Mr. H. L. Rolfe are exceedingly interesting. There is a collection at present on view  at South Kensington which must greatly delight all anglers. I allude to the contributions of stuffed fish which have been sent to the exhibition by various angling and piscatorial societies. A trout over fourteen pounds in weight is shown, also a pike which pulled the scale at twenty-eight pounds. Numerous fine specimens of carp are likewise to be seen, as also, grayling, bream, and perch. The cast of the 72 lb. Tay salmon will at once take the eye. Mr. Rolfe has made it look as like nature as possible. Mr. Buckland has been very successful from time to time in his fish hatching operations, especially with the different kinds of salmon and hybrids of trout. The hatching was most successful this year, and a very varied stock of eggs was deposited, as the following list will show:- Salmo ferox (hatched out February 22); Rhine salmon (March 9); Norway trout, Great Lake trout (hatched February 22); Tyne salmon (hatched February 26); Newstead Abbey trout (hatched March 14) ; Neuchatel trout, common trout (hatched February 20) ; Salmo fario (hatched March 9); silver char, salmon and trout hybrids; sea-trout hybrids from Nuninguen (hatched February 27). It would require many pages of this work to catalogue all the remarkable things connected with his pet subject, which Mr. Buckland has begged or borrowed for his exhibition. He stops at nothing from the whitebait to the whale. When I last visited the museum one great feature was a large skeleton of the latter animal set up on a plot of land outside, it being too large to be accommodated within. Londoners are now fortunate, for they can see at the museum of economic fish-culture, and at the aquarium at the Crystal Palace, much that will interest them in fish life and economy. A moment white, then lost for ever." It is an achievement to have captured living herrings, and it is a still greater feat to keep them alive as we see them in the Brighton aquarium. What may we not learn from that one experiment? As I have again and again iterated, what is chiefly wanted to be known with regard to all fishes is at what age they become reproductive; that is the key to the real economy of the fisheries. Let us but ascertain how long it is ere a fish reaches the age of reproduction, and the greatest secret of the sea will then be in our keeping. living fish, which visit the inland towns, and delight hundreds who never before saw a lobster or an aquatic sheep's head. 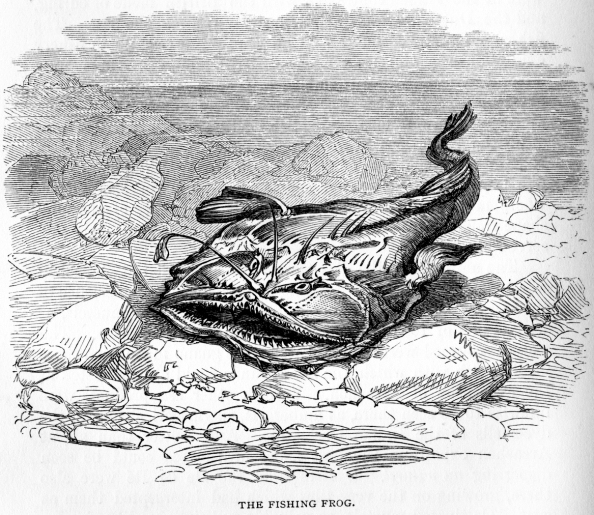 I do not undervalue the study of fancy fishes, and no doubt it interests a large number of miscellaneous visitors to view the sea-horse, the butter-fish, and other curiosities of marine life; but I am in hopes that real good work will yet be achieved by means of these aquaria, and that many points of fish life and economy, especially as regards our food fishes, will be determined by Mr. Lloyd at Brighton, and Mr. Saville Kent at the Crystal Palace. In particular, I hope that one or other of these gentlemen will solve a great many of the questions which have been promulgated during late years in regard to the acclimatisation in this country of various kinds of foreign fishes, about which a great deal was at one time spoken and written, but about which to-day all men are silent. 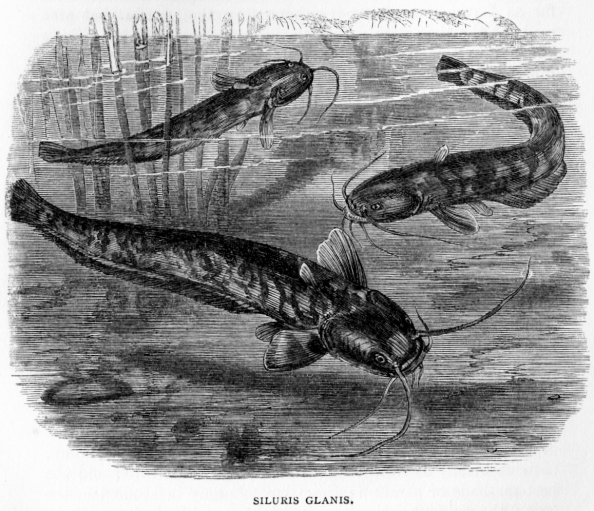 What about the Siluris glanis which some seven or eight years ago was to become a British fish par excellence ? So far as I can ascertain, notwithstanding the parade that was made at the time with regard to the introduction of the Siluris glanis into this country, all attempts to acclimatise it have failed. I gave a figure of the fish in the first and second editions of the Harvest of the Sea, and as many of my present readers may feel some curiosity about it, I beg to reproduce it. In all probability great marine aquaria will multiply. We shall have them not only at all our great sea-side resorts, but in London and in other large inland towns as well. There is nothing to prevent their being erected at any distance from the sea. The Crystal Palace Aquarium Company have solved any riddle that might pertain to that part of the question. Indeed it is a mistake to suppose that fish or other sea animals cannot be kept in healthy life without sea-water. In the Jardin d'Acclimatisation at Paris there was an aquarium (and notwithstanding the events of the war it may be there yet), which was kept going in great style by means of a mixture of salt and water. In Glasgow, for instance, a large Aquarium could easily be erected, and I feel sure it would prove a great attraction, and what is of greater importance-it would pay ! The proper site for it would be in the West-end Park. I have no intention of writing a disquisition on the scientific portion of the aquarium, more especially as regards the sweetening of the water and the best methods of aeration ; these matters may be studied on the spot ; the resident authorities at Brighton and Sydenham will be only too happy to give information on the subject, and excellent handbooks have been issued for both establishments. The real value, however, of these institutions will consist in their solving the problems connected with our food fishes, and it is to be hoped that at an early date lectures and illustrative descriptions of the fishes in the tanks by experts will be instituted as a feature of the exhibitions. produces the pearl. 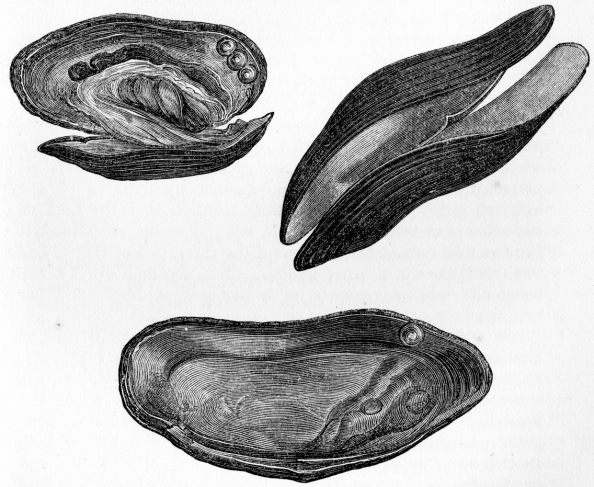 The above drawings of Scottish pearl shells are very accurate, and give a good idea of the style of mussel which produces the most beautiful gem of Scotland. Practised collectors always select deformed or "wrinkled" shells as being more likely to contain pearls than those of a smooth surface. Scottish pearls have become scarce of late, owing to their having been so largely fished for ten years ago-another proof of that wanton disturbance of the balance of nature which always brings its own punishment. Leaving the solution of the pearl problem, both as regards the fresh-water production and that of the sea—the Scottish gem and the Oriental one— to one or other of these great aquaria, we take leave of the subject. If either of these valuable institutions succeed in growing "ropes of pearls," I trust the directors won’t forget who first suggested such a remunerative industry.